SSAS - Inferred Dimension Attributes - are they necessary? I have a cube with fact tables that have a parent-child relationship: Person-Case. Some dimensions are inferred from the parent, e.g. State in the example below. Person does not have a foreign key to the State dimension, but Case does, and through the Person-Case relationship the State is inferred. By doing it this way, I end up with lots of "redundant" dimension attributes from these inferred dimensions. If I want to query the cube, for instance to obtain persons by state, I have to use the dimension attribute of the fact dimension that I am querying, but it is not possible to mix them with attributes from other dimensions. In other words, the red relationship below is not created, and if I drop the State dimension by itself into the Pivot control, I don't get a breakdown by state. I have to use the inferred State attribute of the Person dimension. Is there a better way of doing this, so that State exists only once in the cube? Is it not valid to have hierarchical facts in a single cube? I'm not sure I understand your question fully, so please clarify if necessary. 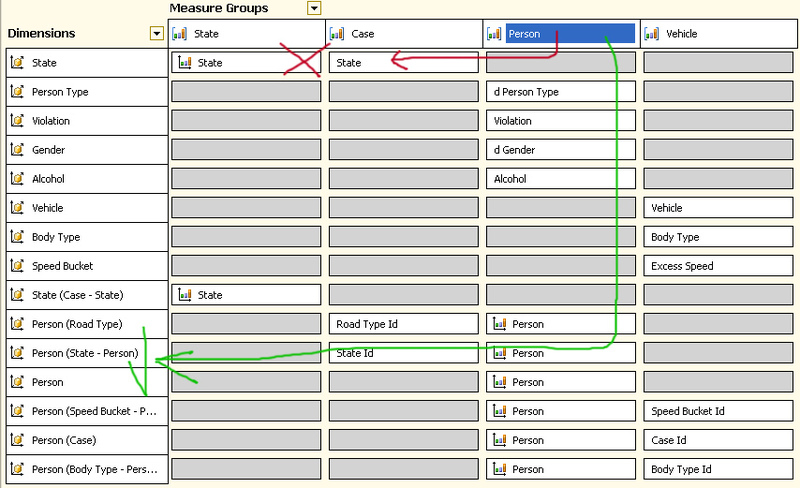 If you want to query the cube to get persons by state, you should add a Referenced relationship between Person and State, using Case as the Intermediate dimension. Deploy and process the cube, and it should work the way you want. Then you can get rid of the (State - Person) dimension. Not the answer you're looking for? Browse other questions tagged ssas or ask your own question. Which is the best way for selecting dimension attributes while creating a dimension? Process dimension task is querying the wrong column! SSAS - Which way to order an attribute?